The sonar layer that can be optionally switched in and out on Navionics charts, although often decried by traditionalists as “not proper charting and not to be relied upon”, can provide useful information in areas where the official soundings may be sparse. With many sports fishing boats now equipped with fish finders and plotters which relay information back to Navionics to incorporate in their sonar layer, the sonar layer may in some cases be more accurate than the chart based on Hydrographic data. The absolute depths in the sonar layer should not be relied upon, but it can show underwater features that are missing or incorrectly placed on the hydrographic charts. 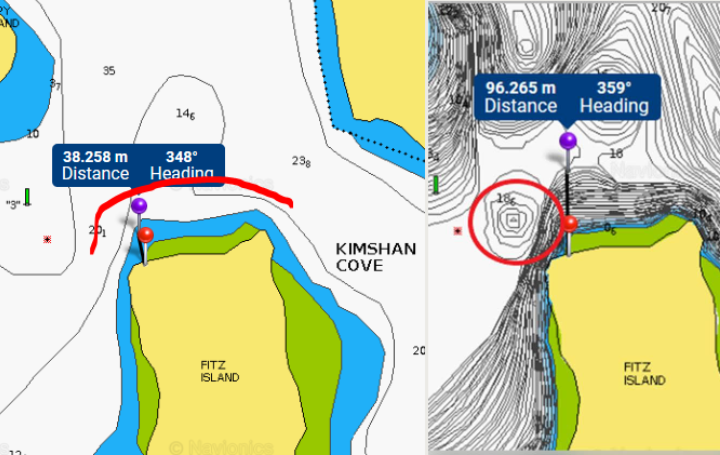 An example is the exit from Kimshan Cove in SE Alaska, where the conventional NOAA based chart suggests the 5m contour line lies about 40m offshore and that the track shown in red would be safe. Switch the Navionics sonar layer in and it shows the shoal water actually extending almost 100m offshore, and just at the point where the conventional chart shows a sounding of 20.1m there is an additional rocky knoll mid passage that has to be avoided.